Kyle Eastwood, IBBME (Prof. James Drake), Analysis and Design of Articulate Neuroendoscopic Instruments Using Contact-Aided Compliant Mechanisms. April 2018. Jieun Kim, IBBME (Prof. Peter Zandstra), Human Umbilical Cord Blood is a Functionally and Developmentally Relevant Source of Macrophages With Therapeutic Potential. February 2018. Richard You Wu, Department of Laboratory Medicine and Pathobiology, (Prof. Philip Sherman), Characterizing effects of prebiotics and human milk oligosaccharides on the intestinal epithelial barrier. July 2017. Rishi Teja Voruganti, Institute of Health Policy, Management and Evaluation (Prof. Eva Grunfeld), Team-based Electronic Communication in the Care of Patients with Complex Conditions. July 2017. Florence Wu, Department of Medical Biophysics (Prof. Robert Kerbel), Targeting the Angiopoietin-Tie2 pathway to inhibit early-stage cancer metastasis. June 2017. Kirill Zaslavsky, Department of Molecular Genetics (Prof. James Ellis). Alterations in transcription and connectivity in stem cell-derived neurons of children with neurodevelopmental disorders. March 2017. Nardin Samuel, Department of Medical Biophysics (Profs. David Malkin & Thomas Hudson). Genetic and Epigenetic Crosstalk Define TP53-Mediated Human Cancer Susceptibility. August 2016. Linda Vi, Institute of Medical Science (Prof. Benjamin Alman), The role of macrophages in bone development, repair and aging. August 2016. Sean Nestor, Institute of Medical Science (Prof. Sandra Black), Automated Brain Mapping to Evaluate the Relationship between Neurodegeneration, Cerebral Small Vessel Disease and Structural Covariance Network Disruption in Alzheimer's Disease. July 2016. Robyn Elphinstone, Laboratory Medicine and Pathobiology (Prof. Kevin Kain). Investigating Mediators of Endothelial Dysfunction as Potential Therapeutic Targets in Severe Malaria. June 2016. Lianne Rotin, Institute of Medical Science (Dr. Aaron Schimmer). Preclinical evaluation of synergistic drug combinations in acute myeloid leukemia. June 2016. Xin (Kevin) Wang, Department of Biochemistry (Dr. Michael Taylor). Unmasking novel epigenetic mechanisms of medulloblastoma pathogenesis. June 2016. Ashish Deshwar, Molecular Genetics (Prof. Ian Scott), Defining the Role of the Apelin Receptor and Mesp in Zebrafish Cardiac Progenitor Development. May 4, 2016. Jonathan Fuller, Institute of Medical Science (Prof. Ross Upshur). The New Medical Model: Chronic Disease and Evidence-Based Medicine. April 2016. Jennie Pouget, Institute of Medical Science (Prof. James Kennedy), Evaluating the Contribution of Immune Gene Variants to Schizophrenia. March 2016. Enoch Ng, Institute of Medical Science (Albert HC Wong and John C Roder, supervisors) The Effects of Neuronal Calcium Sensor-1 Deletion on Mouse Behaviour and Neurophysiology. October 2015. Ilya Mukovozov, Institute of Medical Science (Lisa Robinson, supervisor), Slit2/Robo-1 Signaling in Monocyte and Macrophage Function: A Role in Vascular Inflammation. October 2015. Rob Vanner, Molecular Genetics (Peter Dirks, supervisor) Defining the mode of medulloblastoma growth using the Ptch1 heterozygous mouse model. May 26, 2015. Susan Armstrong, Institute of Medical Science (Warren Lee, supervisor) The Regulation and Perturbation of Vascular Endothelial Permeability. August 19, 2014. Nicholas Light is the 2018 recipient of the Mr. Robert and Ms. Francine Ruggles Innovation Award for his outstanding research productivity and innovation. Aram Abbasian was awarded the Dean Catherine Whiteside Scholarship for Clinician Scientists. Tina Binesh Marvasti, Irene Harmsen, Hannah Kozlowski, and Brian Tsang were awarded a CIHR Vanier Scholarship. Sara Mirali and Siraj Zahr were both awarded a CIHR CGS-D Award. Andy Zheng and Alex Dhaliwal were both awarded a CIHR CGS-M Award. Brian Tsang and Glenn Walpole are winners of the SickKids Restracomp Award. Kevin Wang is nominated to attend the 68th Lindau Nobel Prize meeting. This is a very rare opportunity for young scientists to interact and learn with Nobel laureates in medicine. Nicholas Howell's recent awards: Banting and Best Diabetes Centre Trainee Travel Award; Paul Dudley White International Scholar, American Heart Association Research Award; Best of American Heart Association Specialty Conferences--Top 10% of Submitted Abstracts; Canadian Urban Environmental Health Research Consortium Student Travel Award; Claire Bombardier Award for the Most Promising Student in the Clinical Epidemiology & Health Care Research Program; Robert Dugg Barron Award for the Best oral Presentation or Poster related to Public Health Policy at IHPME Research Day; IHPME Resaerch Day Award Winner for Best Oral Presentation in Patient Literacy & Provide Education. Sydney McQueen was awarded the Pilari Scholarship for Significant Contributions to Medical Education. K. Josh Abraham is the 2017 recipient of the Adel S. Sedra Distinguished Graduate Award. Irene Harmsen received a CIHR CGS-M award. Alainna Jamal was awarded the 2017 Mary Cassidy Award, in recognition of outstanding contribution to extracurricular activities in the Faculty of Medicine. Alainna Jamal received a 2017 CIHR Vanier Award. Amanda Khan is a 2017 recipient of the Mary Cassidy Award, in recognition of outstanding contribution to extra-curricular activities in the Faculty of Medicine. Amanda Khan is a 2017 recipient of the Dr. Robert and Sharon Francis Canadian Medical Hall of Fame Award. Sydney McQueen was awarded the Mary Cassidy Award, in recognition of outstanding contribution to extra-curricular activities in the Faculty of Medicine. Hannah Kozlowski was awarded the Mildred Brown Memorial Award. Natalie Landon-Brace was awarded the Dean Catherine Whiteside Scholarship for Clinician Scientists. Sean Nestor was awarded the Siminovitch-Salter Award for his PhD Thesis. Maneesha Rajora is the 2017 recipient of the Mr. Robert and Ms. Francine Ruggles Innovation Award for her outstanding research productivity and innovation. Ayesh Seneviratne has been awarded a three year CIHR Doctoral Research Award for his project, "Role of Tafazzin in Hematopoiesis and Leukemogenesis." Patrick Steadman was awarded 'Graduate Scholar' by the University of Toronto Alumni Association. Glenn Walpole received an OGS award. Sydney McQueen has been awarded a CSCI-CITAC Poster Award. K. Josh Abraham is the 2016 recipient of the Mr. Robert and Ms. Francine Ruggles Innovation Award for his outstanding research productivity and innovation. K. Josh Abraham earned 1st place prize for top basic science abstract selected for oral presentation at UME's 2016 Medical School Research Day and the 1st place poster prize at Lab Medicine and Pathobiology (LMP) Graduate Research Conference, Toronto, ON. Caitlin Chrystoja is the recipient of a 2016 CIHR Vanier Aaward. Robert Civitarese received a 2017-17 Ontario Graduate Scholarship. Nicholas Howell received the 2016 Nishant J. Fozdar Memorial Award by the Faculty of Medicine. Amanda (Amy) Khan is the 2016 recipient of the Ankle Award, awarded to a medical student who has completed a project that represents creative, or “outside the box” thinking with an outcome or outcomes related to improved health systems, patient care, research results or new ways of completing tasks that enhance medical practice, for her project, "Defining the Safe Limits of Force in Laparoscopic Surgery." Amanda (Amy) Khan was awarded the 2016 Perioperative Services Innovation Grant from the Hospital for Sick Children, Toronto. Amanda (Amy) Khan was selected as one of Canada's Most Powerful Women: Top 100 by the Women’s Executive Network (WXN). Hannah Kozlowski was awarded the inauguaral Dean Catherine Whiteside Scholarship for Clinician Scientists. Sachin Kumar received the Michael Gregg Memorial Award through the UME. Natasha Lane was awarded the 2016 Ted Goldberg Award for Academic Excellence and Promise in Health Services Research. Natasha Lane was awarded 1st Place in Oral Presentation Competition and 2nd Place in Poster Competition at the Four City Geriatric Research Day. Chris McFaul received an NSERC CGS-M.
Sydney McQueen received "Best Poster Award" at the Medical Student Research Day (MSRD) at the University of Toronto. Ben Ouyang received a CIHR Vanier and a Cecil Yip Doctoral Research Award. Siraj Zahr received a CIHR CGS-M award, and a poster prize at Medicine By Design 2016 Inaugural Symposium. K. Josh Abraham was recognized as the student with highest academic standing in his department with the 2015 Laboratory Medicine and Pathobiology (LMP) Graduate award. Brian Ballios has been selected as a recipient of the 2015 Gordon Cressy Student Leadership Award. 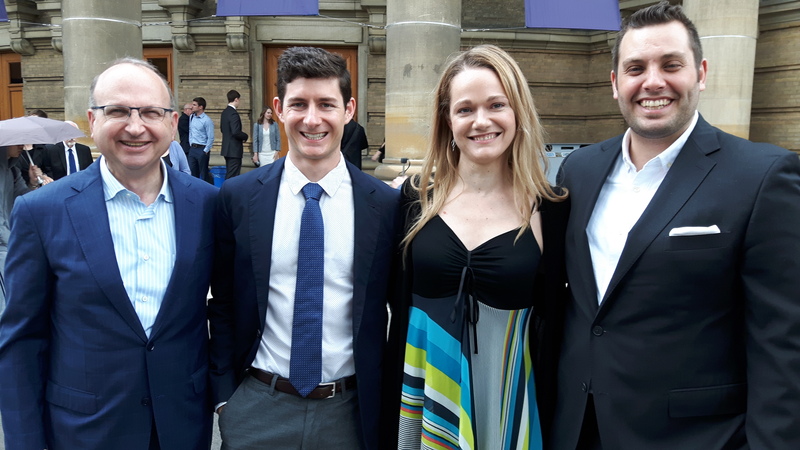 Caitlin Chrystoja was awarded the The Canadian Journal of Surgery Editor’s Choice Award for ranking as 1 of the 3 best surgery abstracts among 270 submissions from surgery residents at the Canadian Surgery Forum. She also received The Canadian Association of General Surgeons (CAGS) Science Award at the Canadian Surgery Forum in recognition of submitting 1 of the 2 best surgery abstracts among 270 submissions from general surgery residents at the national conference. Ayan Dey was awarded the 2015 Finkler Graduate Student Fellowship for his research "functional pathoconnectomics of Cerebral Small Vessel Disease: a cognitive neuroscience based approach to understanding variability in vascular cognitive impairment." Kyle Eastwood received a 2015 CIHR Vanier Award for his research, "Development and Efficacy of Procedure Specific Instruments for Neurosurgery." Kyle Eastwood was the 2015 recipient of the Mr. Robert and Ms. Francine Ruggles Innovation Award for his outstanding research productivity and innovation. Carlyn Figueiredo received a 2015 CIHR Vanier Award for his research, "Gold nanoparticles with surface enhanced Raman scattering capability for the detection and treatment of glioblastoma tumours." Nicholas Howell received a 2015 CIHR Vanier Award for his research, " What are the effects and economic impacts of walkable neighbourhood design on type 2 diabetes care?" Amanda (Amy) Khan received a 2015 CIHR Vanier Award for her research, " The Development of Anthropomorphic Realistic Model "Phantoms" for Surgical and Medical Education." Patrick McVeigh is the 2015 recipient of the Ankle Award, awarded to a medical student who has completed a project that represents creative, or “outside the box” thinking with an outcome or outcomes related to improved health systems, patient care, research results or new ways of completing tasks that enhance medical practice. Maneesha Rojora received a 2015 CIHR Vanier Award for her research, "Delivery of traceable, multifunctional, biomimetic nanoparticles to the brain to treat Alzheimer's disease." Lianne Rotin is a 2015 recipient of a CIHR Frederick Banting and Charles Best Canada Graduate Scholarship for her project titled, "Investigating ibrutinib's off-target activity against acute myeloid leukemia cells." Graeme Schwindt received the Hendry Memorial Scholarship and won the Cody Silver Medal for placing second overall in the graduating MD class of 2015. Shrey Sindhwani received a 2015 Faculty of Applied Science & Engineering Graduate Student EndowmentFund (GSEF) Scholarship Award and a Wildcat Voyager Scholarship. Patrick Steadman received a 2015 CIHR Vanier Award for his research, " Investigating Memory Neuronal Networks For Regulating Behaviour In Healthy And Disease States." Ho Yee Wan received a 2015 CIHR Vanier Award for his research, "Microvascular alterations after experimental subarachnoid hemorrhage." Ayan Dey received the Canadian Partnership in Stroke Recovery Trainee Award in 2013/2014 for his research "Investigating the phenotypic heterogeneity of Cerebral Small Vessel Disease using multimodal functional neuroimaging." Robyn Elphinstone received a 2014 CIHR Vanier Award for her research “‘Pharmed’ Red Blood Cells as Novel Therapeutics for Life Threatening-Infections”. Jennie Pouget was a 2014 Weston Fellow, travelling to the Netherlands to work on her project, "Using Big Genetic Data to Identify Immune Targets that will Advance Treatment Development in Schizophrenia." Jennie Pouget was also awarded a 2014-15 Fulbright Canadian Students Scholarship for her research into the biological underpinnings of mental health. Linda Vi is the 2014 recipient of the Mr. Robert and Ms. Francine Ruggles Innovation Award for his outstanding research productivity and innovation. Jonathan Fuller was awarded a CIHR Vanier Award in 2013 for his research “A Philosophical Analysis of the Current Chronic Disease Model and Implications for the Care of Complex Older Patients”. Jonathon also received an inaugural Weston Fellowship to spend one year studying abroad. Robin Elphintone received the Chinese-Canadian Medical Society (Ontario) Award in Anatomy, and an ASTMH 2013 Annual Meeting Travel Award. Nardin Samuel won a “Scholar-in-Training Award” from the American Association for Cancer Research to attend an upcoming conference. Xin (Kevin) Wang is the 2013 recipient of the Mr. Robert and Ms. Francine Ruggles Innovation Award for his outstanding research productivity and innovation. Susan Armstrong received the Canadian Critical Care Forum 2012 Garner King Award, 1st Place – Trainee Oral presentation in October. Susan also won an award for Best Oral Presentation at the Canadian National Medical Student Research Symposium in June in Winnipeg. Jennie Pouget has been awarded a Brain Canada Training Award in 2013 for her project entitled “Role of variants of the translocator protein (TSPO) gene in schizophrenia and antipsychotic-induced weight gain”. She has also received an American Society for Histocompatibility and Immunogenetics Travel Award to attend the International Summer School on Immunogenetics in Stintino, Italy (Sept 2013). Ashish Deshwar won the Roman Pakula Award – Awarded to the best acclaimed all around M.Sc. student registered in the department of Molecular Genetics. Robert Vanner received a CIHR Vanier Scholarship in 2011 for his research on “Identification and characterization of quiscent brain tumor stem cells”. Florence Wu is a 2011 recipient of a CIHR Vanier Scholarship for her project “Angiopoietin-1 mimetics: new therapeutic agents for cancer treatment”.